The Membrane Sheet is welded on each sode of the membrane panel. Treated water peramertes through the membrane sheets and spacers to come out visa the nozzle. Type 151 cartrdge has two nozzles.These can permeate from all over the membrane sheets equally to prevent the larger membrane sheet from fouling for a long time. The membrane shete is made from clorinated polythylene with a maximum pore size of 0.4 μm (average:0.2 μm). 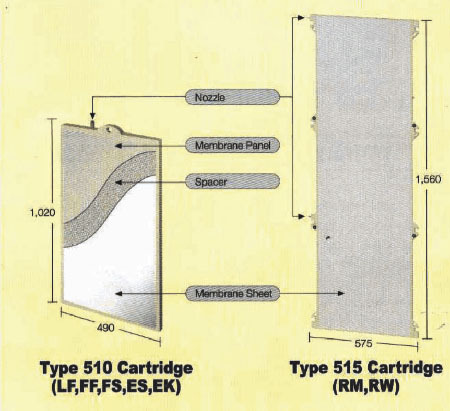 The flat plate structure of a membrane cartridge presents less obstacles to sourcing flow. Less screening resides such as coarse solids and fibrs to be tangled to the submersged Membrane Unit can reduse the need and frequency of chemical cleaning. You can clean the Submerged Membrane Unit in-suit eith chemicals such as sodium hypocloride for organic fouling or oxalic acid for inorganic fouling.Since the membrane unit do not need to be removed from the membrane tank and placed in a saperate purpose-built chemical cleaning tank,this system results in significant resources saving. You can locate a damaged membrane cartridge easily by lowering the water tank and visually checkinh the individual permeate tubes, with no need to drain the tank or inspect the entire membrane unit. Since membrane cartridge can be individually removed, you do not need to replace the entire membrane module or remainder of functional cartridges.